Volunteering has been an integral part of the lives of people and communities all over the world. Individuals and institutions benefit from the valuable assistance of volunteer workers who share their knowledge, skills, time and resources in the areas of technical assistance, social services, humanitarian support and peace-building with remarkable dedication and commitment. Indeed, governments and societies owe much to these special breed of modern-day heroes who do not expect material reward for their services and whose work is exemplified by compassion and love for others. The Philippines is a country which takes pride in its rich history of volunteerism through the "bayanihan", the tradition of helping one another to promote family, community and society’s welfare. Through the years, this Filipino brand of volunteerism evolved to engage all sectors - government, not-for-profit, academic institutions and corporate groups to participate in volunteer service for development. Recognizing the important role of volunteerism in nation-building, the Philippine Government has designated the month of December as the National Volunteer Month (NVM). NVM aims to build nationwide public awareness and appreciation of volunteerism, create the environment for voluntary action and recognize volunteers as partners in development. 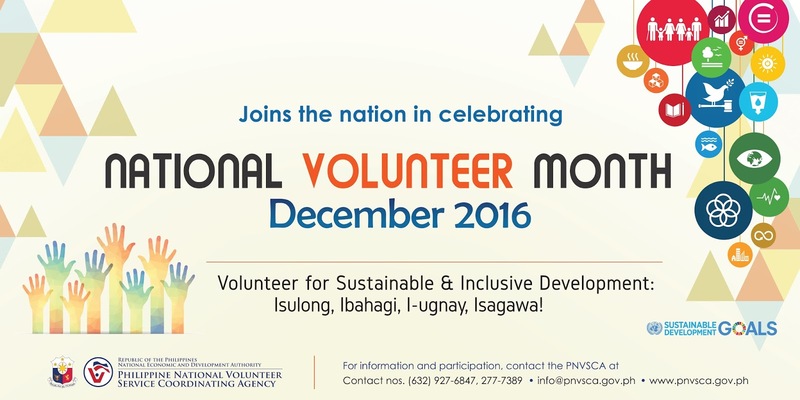 Through NVM, all sectors of society are enjoined to participate and promote their causes and agenda that support volunteerism. Since its declaration in 1998, NVM caps the year-long activities of the volunteer community in the country as a fitting recognition to their selfless dedication and commitment to serve people and communities in need. The focal point for the NVM celebration is the Philippine National Volunteer Service Coordinating Agency (PNVSCA). PNVSCA is assisted by a National Volunteer Month Steering Committee (NVM-SC) composed of representatives from the government and the private sector in planning and organizing the event. To cascade the celebration at the local level, NVM Regional Committees chaired by the NEDA Regional Offices and the Regional Planning Office of the Autonomous Region in Muslim Mindanao are also constituted. Sister Eva Fidela C. Maamo, SPC, MD, serves as the NVM Honorary Chair for 2015-2016 and leads the NVM advocacy campaign. The theme of NVM 2016 is “Volunteer for Sustainable and Inclusive Development: Isulong, Ibahagi, I-ugnay, Isagawa!” in support of the Philippine commitment to the global Sustainable Development Goals (SDGs) and the government’s agenda of poverty alleviation and good governance.